Filling a gap in our ongoing MEGA Bloks Halo look-back, today we're reviewing a highly desirable set from 2012. Purple bricks at the ready, as our growing Covenant army of the Banshee and the Ghost is being bolstered by a beefy addition. We cruise onto the battlefield in the Covenant Wraith. 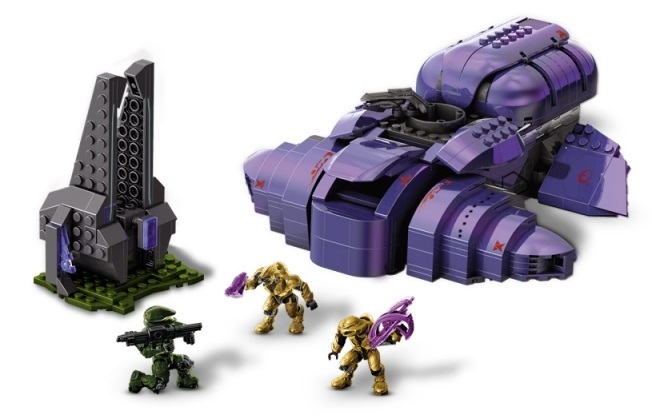 This 2012 MEGA Bloks set comes with three micro action figures (the older style - more on those later) and 637 parts which combine to build the tank-like Wraith and also a bit of terrain in the form of a Forerunner structure. The whole thing probably took us about three hours to complete, being made almost entirely from rich purple and speckled grey bricks. Lets have a gander, shall we? Obviously the most striking part of the set is the Wraith itself, and although at first (going mostly on the images on the box) we thought it looked a tad too blocky, there are actually some nice curves and lines in the design. We wouldn't say it was a tricky build, but with so many parts of the same shade going together at once, there were times when we accidentally added the wrong piece at the wrong time. We definitely recommend you build this in natural daylight to better see the instructions. Elements of the model to note are the pop-up cannon on top, the rotating turret in the middle, the opening cockpit up front, and the swivelling engines/fins at either end. The whole thing is very solidly put together, with no hallow space on the interior except for the cockpit and turret. So its pretty weighty despite its relatively compact size. There's more to see at the rear including an exhaust vent, the bulbous build of the cannon housing, and also (just) the transparent pieces that help create the illusion that the Wraith is levitating. The rear of those side parts also looks cool, with some great detailing and transparent studs to create engine glow. The bits on the end can spin 360 degrees. ...the Fuel Rod Cannon can be deployed by pulling the whole thing out and extending the side flaps. It can pivot up and down, but not side to side. In front of that you'll find another weapon set on top of a turning turret. This is the same piece employed by the Scorpion, albeit with a more Covenant-looking weapon affixed. A figure can easily slide in here and grasp the weapon handles. And, obviously, you need a driver. The cockpit section is spacious enough to comfortably accommodate a figure with the cover closed, and once all locked up its hard to even tell that it is a door. The shot above also details some of the stickers applied to the set, and yes... unfortunately some of those have to be placed over multiples bricks. We don't like doing it, and certainly it makes it harder to dismantle and reassemble the set, but luckily there are enough single-part stickers too. The Wraith has a nicely aggressive design when viewed from above, and all sense of awkward blockiness is lost. It has a tough and substantial feel and seems to be more than a match for the aforementioned Scorpion tank. The set also gives over some parts for the Forerunner structure; a bit of interesting terrain built on top of a nice green terrain base. The majority of the parts are of the same shade as the Wraith's grey parts, but includes large plate pieces and sloped bricks. A few trans blue parts are well used here, to give it a suitably alien feel, as well as multi-directional building techniques. You can either build it up, play with it and admire it, or smash it to bits to use the parts for other builds (as we eventually did!). Still, as added extras go, this is pretty decent. ... you get the helmets, torsos, and arms of two separate types, a Scout with ODST armour (R), and an EOD (L). This is great in terms of spare parts for your figure collection, but we were wondering why MEGA didn't just go ahead and included another set of legs, therefore giving us two separate Spartans. Oh well. Of the two variants, the Scout was our favourite, coming as he does in dark green with an even darker wash and gold visor. Some nice paint application here, but compared to the modern Scout figure (one of which was included in the Fireteam Venom Battlepack) it looks a bit out of proportion. The Elite figures are pretty awesome looking, with very bright and striking gold paint. The level of detail here surpasses even the Spartan parts, and it is nice to get two separate kinds of Elites, when MEGA could so easily have included the same figure twice. But, once again, this is the older design of Elite figure which lacks the articulation (and height) of the modern versions. 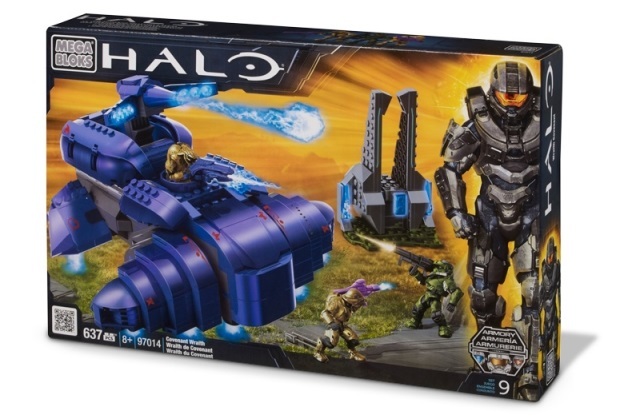 A great set for Covenant army builders, and for any fans of brick-building systems altogether, the Wraith is a fun and satisfying medium-sized set with some great features and interesting figures. Although no longer being made by MEGA Bloks, the set is still out there to be snapped up, and even seems to be quite desirable for collectors. We scooped ours up for an incredible £12 on Ebay, so keep 'em peeled to grab yours too.